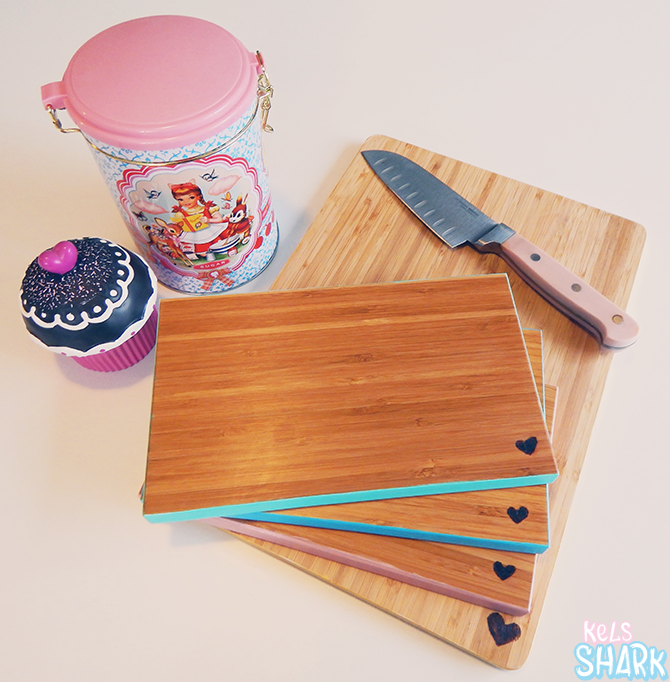 Kels Shark: Project: Spice up Your Cutting Boards! 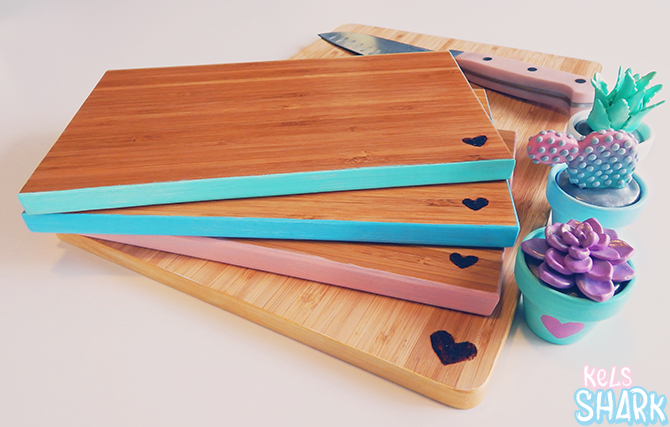 Project: Spice up Your Cutting Boards! Note: I wrote an update post about the effectiveness of Dishwasher Safe Mod Podge here! 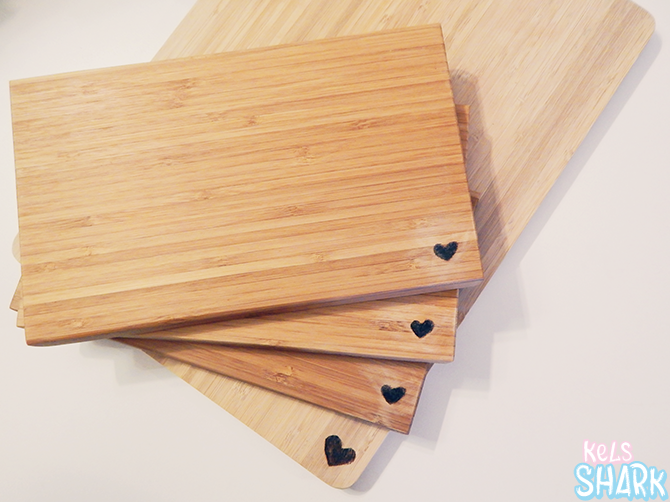 Since one of my goals for the Sweet Life Coaster Project was to try out Dishwasher Safe Mod Podge ("DSMP"), I thought it would be fun to try another simultaneous DSMP project and spice up a few plain, wooden cutting boards! For safety reasons, I didn't want to apply anything to any part of the cutting board I actually use. After all, I'd literally be cutting into its surface! As such, I limited painting to the edges of the board. For the top surface, wood-burning seemed like a safe way to add a simple design. Make sure the cutting boards are completely dry. Use the woodburner pen to burn a design of choice on the cutting board. If possible, practice on scrap wood first. The woodburner pen was not super easy to use or forgiving - if it's your first time using one, pick a simple design and follow the instructions carefully! I'd never tried the pen before, so I chose freehand hearts, which turned out a bit lopsided. If you're more talented, you could burn in a design indicating the cutting board use (a veggie, a piece of cheese, etc.). When the surface has cooled down, use the sand paper to sand away any excess wood grains from the woodburning. Don't worry if it ends up a bit scratchy - when applying the wax later, it'll smooth out. Use the foam brush to apply a layer of gesso to the edges of the cutting board. If any gesso seeps onto the large surface, just wipe it away with a paper towel. You could probably skip this step and paint directly, if you'd like - I just prefer to prep surfaces before painting. When it dries, apply an additional layer if you think it's necessary for even coverage. Wait for the gesso to dry fully. * Remember to wash off your foam brush between steps, as the Mod Podge will dry on your brush too while you're waiting for the surfaces to dry! Mix paint colors if applicable. Once the edges are dry, use the paint brush to paint the edges. You may need to allow the paint to dry and then apply more layers, if the paint coverage is too thin. Wait for the paint to dry fully. Use the foam brush to apply a layer of DSMP over the painted edges. Make sure to cover the paint fully! Always the toughest step! DSMP takes 30 days to fully cure. 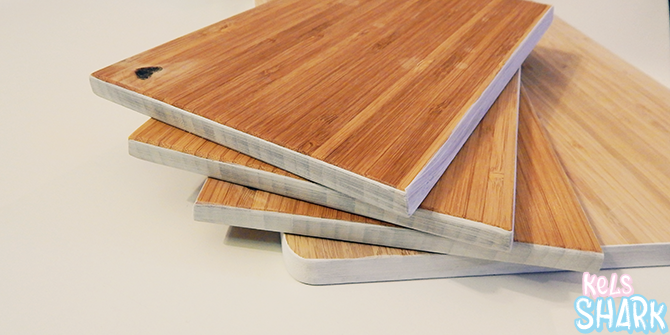 You're supposed to re-finish wood cutting boards regularly, as the coating will wear off and water can seep in, causing your board to crack, mold, and rot. Ew - no thanks! I figured since we messed with the surface of the board, it's probably safest to re-finish your board before using it. Follow the instructions on the product. Voila! 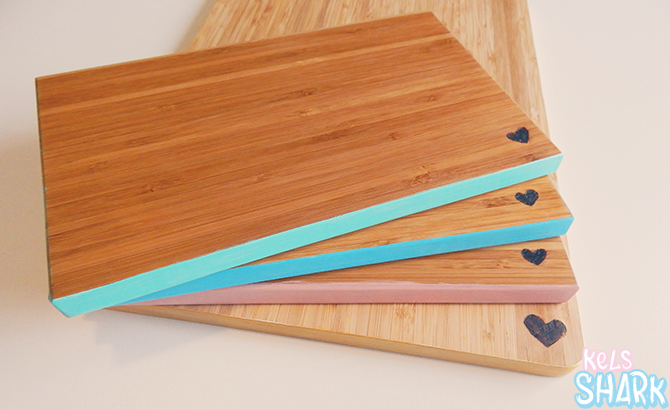 Prettier cutting boards! With the DSMP layer, the boards should be safe to wash (with water and light soap) without the paint coming off. Project Post Guidelines: Want to share a project you saw on Kels Shark? Please read my FAQ page first! I always appreciate social media links shares and I love seeing how your version of a project you saw here turned out (send a picture/link my way!). Project posts take a long time to compile, so please respect the time and energy put into these posts when sharing them on your own blog. Thank you! Want to see more projects? Check out my projects page! OMG!! TOO CUTE! My mom's cutting board just broke actually... this would be so cool to make for her! You totally should! This was one of the easier projects (and more popular ones on social media)! These are absolutely adorable! I had no idea dishwasher safe mod podge existed! I'm going to have to start thinking about projects now if I want them to have time to cure before Christmas though! Thanks, Rebecca! I think Dishwasher Safe Mod Podge is relatively new - I only saw one tutorial using it when I looked it up, which is part of why I wanted to try a few projects with it! But yeah, it is totally obnoxious that it takes 30 days to cure. Definitely gotta plan ahead! Thank you for commenting - I read every single one! =) If you have a general question or request, please check the FAQ page and then the Contact page (if your question has not been answered yet). Thanks for visiting! have new posts delivered to your inbox! 3-Month Update/Review: Dishwasher Safe Mod Podge Projects! Indie Interviews | Plush World with Laura of Teacup Lion! Share book reviews and ratings with Kelsea, and even join a book club on Goodreads. Kelsea Echo on Shana Logic! Copyright Kelsea Echo 2014. Powered by Blogger.